Getting to design your own jewellery is probably something a lot of people don’t think they’ll ever get the chance to do. I had heard about Diwah through some other local bloggers, as the company is based in Newcastle. So when I began working with them, they asked me to design my own necklace! I went onto the website and clicked the design I liked and began editing on the site. The editor allows you to choose each bead and you can click and drag everything around until you’re happy with it. Whilst you’re doing so, it updates you on the price- making sure you don’t overspend! I proceeded through the checkout and a few days later I recieved an email with these photos- showing me how my designs were being made! Even the photos of my items being handmade are gorgeous! So what did I pick and why? I’ve always been obsessed with the sea. I love that Newcastle is right on the coast and a short trip on the metro gets me out of the grey concrete of the city to the soft sand and blue skies of the beach. I feel so calm out there. I really hope someday I get to live right by the coast. I designed the ‘Seawolf’ because I love the sea and wanted some jewellery that linked to my blog name and identity. I love the colours and chose them based on a sea palette; a mix of golds, pearls, light and bright blues too. 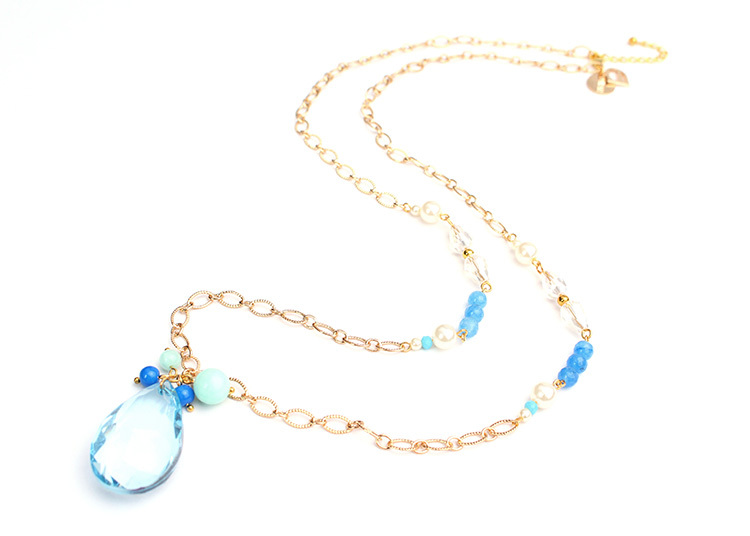 The glass pendant It’s a perfect everyday type of necklace and I’m so glad I designed it. I continued my theme of the sea with the aptly named ‘Starfish’ bracelet. Such gorgeous, light, romantic colours! I wore it to my exam so i’m hoping it brought me some luck! Perfect for everyday wear! This is the ‘Teal and Gold Jewelled Collar’. I wanted something I could wear on special occasions and nice evenings out as well. It is just gorgeous and I feel so feminine when I wear it. If you want to see them in person, I featured them in my August favourites video below! I honestly can’t recommend Diwah enough. Fast delivery in the most gorgeous box, with a handwritten card, and everything so carefully packaged! All for a really affordable price too. Check the disclaimer at the bottom to get to their website to get your own gorgeous accessories. Previous Post 1YRWL PLAN: Month 1 Update!